A drug which blocks the urge to eat can help dieters shed pounds and inches, a study suggests. Belgian researchers writing in the Lancet said people taking rimonabant lost an average of 8.6 kilograms (18.9 pounds) in a year. They also lost an average of 8.5 centimetres (over three inches) from their waists. UK experts commented that rimonabant might help people lose weight - but could not replace eating healthily. In the UK, it is estimated that one in five men and a quarter of women are obese. The researchers from Antwerp University Hospital studied 1,507 people from Europe and the US who were obese or overweight. They were either assigned to take 5mg or 20mg of rimonabant or a dummy pill each day. All those taking part in the study were also advised to cut 600 calories from their daily intake. Nine hundred and twenty people completed the year-long study. Just over 39% of those who took the higher dose of rimonabant lost more than 10% of their bodyweight. People on the higher dose of the drug lost an average of five kilograms (11 pounds) more than those taking the dummy pill. They also cut their waist measurement by an average of seven centimetres (just under three inches) more than those on the dummy pill. Carrying weight around the abdomen has been shown to put people at high risk of heart disease and diabetes. A separate study by Karolinska Institute researchers in Sweden, published in the British Medical Journal on Friday, showed people with a waist measurement of more than a metre, equivalent to 39.4 inches, were at highest risk. The Dutch team taking the higher dose of rimonabant showed improvements in cardiovascular risk factors such as cholesterol levels, insulin resistance and metabolic syndrome, a condition which can increase the risk of heart disease. However, they also showed the highest level of side effects such as nausea, dizziness and diarrhoea. Rimonabant works by blocking the endocannabinoid system in the brain which regulates hunger. Dr Luc Van Gaal, who carried out the study, said: "Treatment with rimonabant over one year led to sustained, clinically meaningful weight loss, reduction in waist circumference and associated improvements in several cardiovascular and metabolic risk factors." UK experts said the drug was effective - but only in conjunction with dieting. 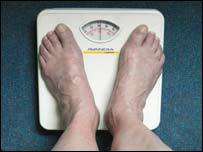 Dr David Haslam of the National Obesity Forum, said: "This drug appears to be very successful. "This drug doesn't offer an easier way of losing weight. But it appears to help you do it more successfully." Nilami Sritharan, a nutritionist with the Medical Research Council, said: "These are very encouraging results. But it's important to remember drugs such as these are only an adjunct to improving your diet and lifestyle." Professor Steve Bloom, an obesity specialist at Imperial College and Hammersmith Hospitals, said: "This drug is a helpful addition. But one would need more clinical studies to make sure it is safe." "Fighting the fat is a war not everyone wins"